Juicy Tottori 20th Century Pears from Japan. Juicy and sweet like a pear. Refreshingly sweet and brimming with juice, Tottori 20th Century pears from Japan are exquisite in both appearance and taste. The pale green-yellow luminescent exterior is elegant and understated. The crisp, white texture is the perfect counterpoint to the sweet finish. Few fruits deliver such a distinctively different experience, perhaps because Tottori 20th Century pears are grown in such a unique, traditional manner. 20th Century pears are tree-ripened to perfect sweetness and flavor and will not ripen further after being picked. Tottori pears are clear-skinned Asian pears, members of a family of pears also known as Nijisseiki. 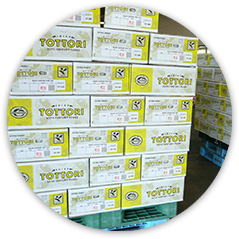 Check for Tottori pears in stores from September through January. Be sure to stock up this fall! 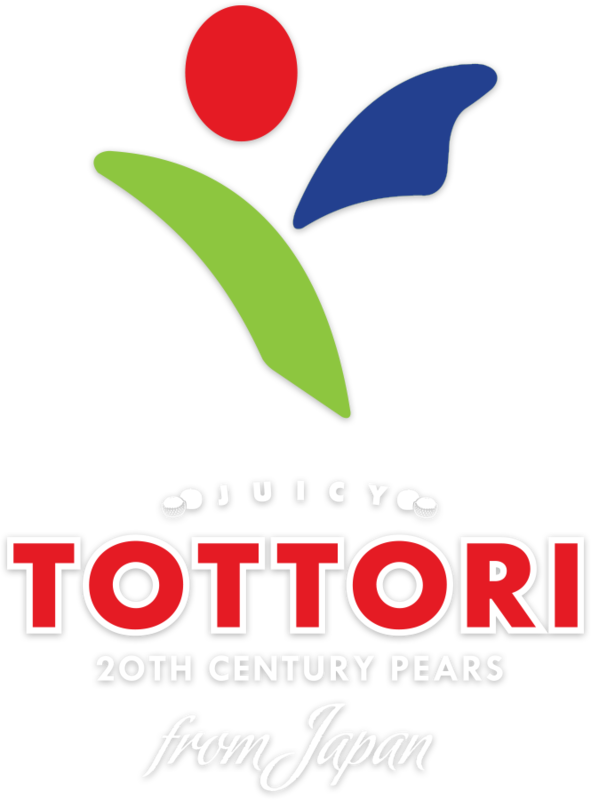 Tottori 20th Century pears were first found growing wild in Japan at the turn of the century for which they are named. They grow on hillsides in the Tottori region on the northern coast of western Japan. The original pear tree still stands there today. Its seeds are transplanted every year and offspring are carefully nurtured by hand—a tradition that spans the centuries. Tottori pears are grown with special care and attention to produce stunningly big, beautiful pears. In the beginning, each blossom is meticulously hand-pollinated by the grower. 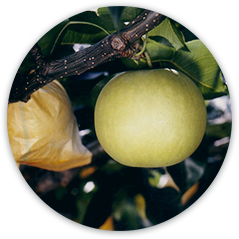 As the fruit has begins to mature, each pear is wrapped in a waxed paper bag to protect it from pests and the elements as it grows. 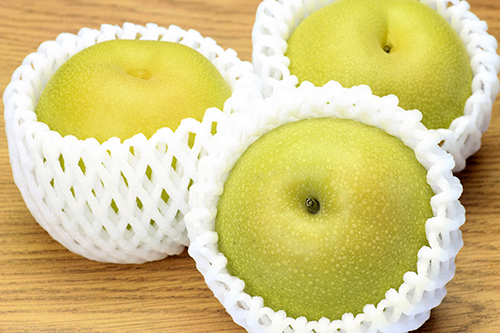 In September, when the pears have reached full maturity and are juicy and sweet, they are harvested by hand and packed in individual recycled mesh socks to protect their delicate skin from bruising during transport to markets throughout the world. The most wonderful way to enjoy a Tottori pear is fresh, chilled, sliced and arrayed on a plate. Savor the satisfying juiciness, crisp snap and delicate sweetness of this pear as it fills your mouth with a burst of flavor. 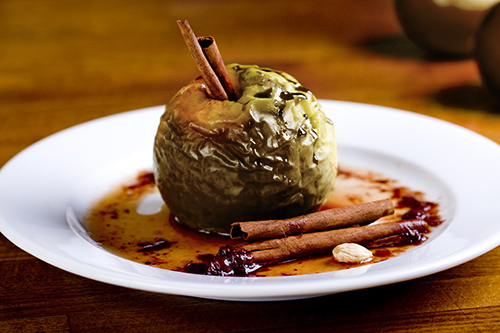 Traditionally shared at the table after dinner, a Tottori pear’s generous size makes it perfect for sharing. In Japan, Tottori pears are often relished sliced with a pinch of salt and a squeeze of lemon juice—often the simplest of ingredients can be the most enjoyable! Add a hint of refreshing sweetness to green salads with Tottori pears. 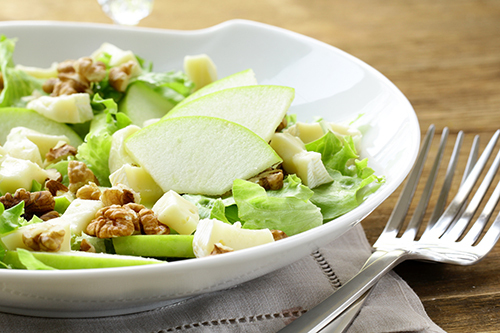 Cut pear into slices or cubes, toss with greens, cranberries and walnuts to make an exquisite salad. Or thinly julienne and toss into your favorite coleslaw recipe. Sauté with cinnamon and a little honey as the perfect topping for waffles, ice cream and more. Also try coring and baking whole, stuffed with raisins, dates and brown sugar. Slice thinly and add to a grilled cheese sandwich before cooking. For extra zing, serve with a little Kimchee on the side. If you prefer a wrap, for some extra crunch, simply add julienned strips of Tottori pears to your favorite wrap recipe before rolling. The sweet fragrant flesh and high water content makes this pear a natural for serving with wine and cheese. Try pairing with Swiss, Camembert, Parmigiano-Reggiano, Stilton (or your favorite blue cheese). For a quick pick me up, core and cut Tottori pear into ½” rounds. Spread with your favorite nut butter and top with granola or coconut. With nutrient values similar to apples and European pears, Tottori 20th Century pears offer a culinary alternative to sugary snacks and desserts. They also provide a deliciously different way to add more servings of fresh fruits to your daily routine, for better health and quality of life. Tottori pears are low in saturated fat, cholesterol and sodium. They are also a good source of vitamin C and vitamin K, and qualify as a very good source of dietary fiber. Asian pears have notably high water and fiber contents presenting clear benefits as an all-natural, functional digestive aid. 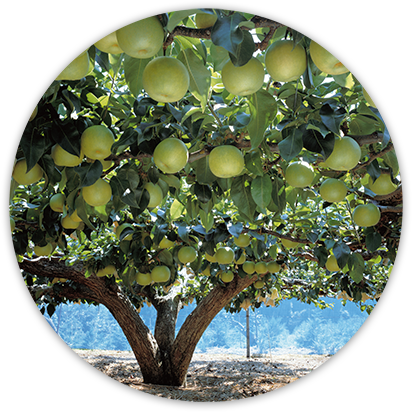 Tottori pears also contain lutein and zeazanthin, micronutrients linked through clinical research to maintaining eye health and preventing macular degeneration. 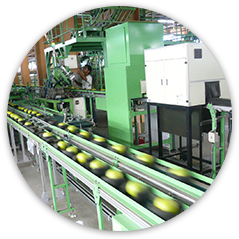 In the USA Tottori pears are marketed to your local retailer by The Oppenheimer Group (Oppy). Can’t find them in your local store? Be sure to talk to your produce manager about bringing them in.